Are you ready to step up to the plate this holiday season? We're sure you're going to shine. How have you been preparing? There are amazing culinary blogs to surf, food podcasts to listen to, and Pinterest pins to save. Plus, you just might want to get Grandma's cookie recipe to impress your coworkers this year. But here's the thing, when you're gathering all this holiday cheer in one kitchen, you've got to dress for success. 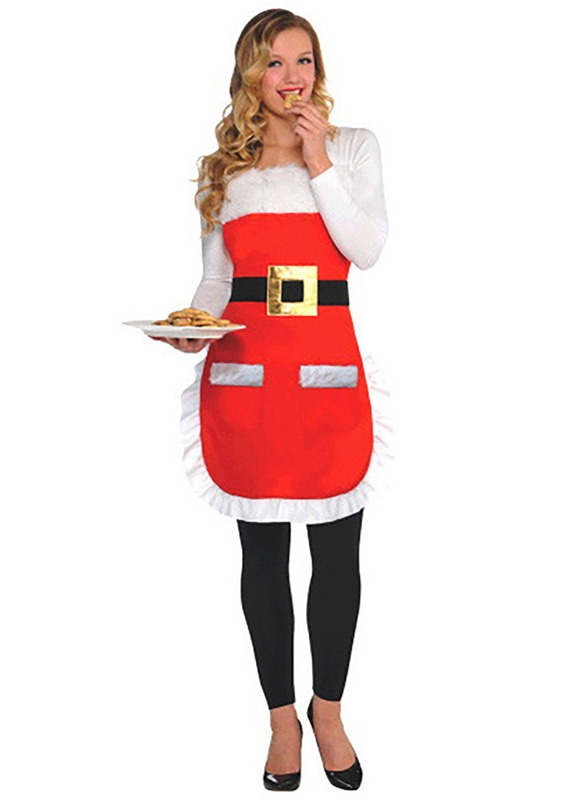 What better way to amp yourself up to unveil your Christmas feast than with this cheerful Christmas apron. This look is ready to help you with your confident hostess persona. With white ruffles, a wide Santa belt, and a faux fur trim on top, you'll be a Christmas star even if that Crab Rangoon casserole doesn't turn out exactly how you thought it would. You'll feel like a boss when you're bringing out plates of food at your holiday get-togethers this year. Hey, maybe you're not into cooking. Maybe you simply bought a plate of cookies, warmed them up in the microwave, and told everyone they just came out of the oven. No matter what you're serving, you'll look like the best holiday hostess when you're rocking this apron!